We're a small family farm owned and operated by Paul and Joanne Mosher north of Monon, Indiana. We specialize in meat raised right here on our own farm with no growth hormones. We only use antibiotics at minimum doses when absolutely necessary to keep animals healthy. When you buy from us, you know what you are eating. The grocery store may sell at a lower price, but our beef and pork are much better tasting and much better for your health. Just one bite and you'll be saying — HOLY COW! Best of all, we're right around the corner. You know where your meat was raised, and you know who's accountable — us. We can tell you anything you want to know about the animals that provided your meat. If you have any questions or suggestions, please email or call us! We would love to hear from you! Our philosophy is that healthy and happy animals produce the best quality of meat, so our animals enjoy a low-stress, fresh air, healthy lifestyle. We offer both beef and pork by the whole, half, quarter (beef only), or by the package. We have been raising quality freezer beef since 1998 on our small family farm north of Monon, Indiana. After several years of selling beef locally to repeat customers, we knew we produced a quality of meat that other families wanted for dinner too — a meat that was grown with care on the farm. A vision for our small farm grew and the reaction was — "Holy Cow!" Now, the Mosher family is proud to offer Holy Cow Farm Fresh. Holy Cow Farm Fresh is the same small family farm with the same quality of farm fresh meats, but with a fun name that makes you smile. Our animals live a very low stress happy life here on the farm. (Less stress hormones and adrenaline in the animals lead to a better tasting meat.) We spend a lot of time with all of our animals, and we know that happy animals lead to the best quality of life for them and the best quality of meat for you. We raise crossbred beef cattle on high quality forages. We have mostly crossbred cattle, which is heavy on the Angus/Limousin breed. As far as pasturing our beef, some of which are born right here on our farm, are pastured with their mamas with only pasture and hay (which we grow mostly all ourselves, unless we have a shortage). Our processor typically hangs the beef to age it before processing for around 10 days, which also ensures very tender meat. We do not use hormones or antibiotics on our farm to enhance beef growth. 100% grass-fed beef: Our grassfed beef is finished on just pasture grass and hay, NO grain. Amazingly, if you put good food in front of a beef, it will eat and grow well. Grass finishing, while more difficult and limited by the seasons, results in higher omega-3 fatty acids. Grass-fed/grain-finished beef: At maturity, some receive our own grain, in addition to the available forages, to achieve the grain-finished tenderness and marbling that is highly prized. We'll be a while building up our grassfed inventory, but with either finishing technique, you're getting a pure, clean, high quality product you will love. Our meats are good — really good! But don't just take our word for it — please read our testimonial page. We also raise crossbred pigs. Our pigs live outdoors in the fresh air and have a shelter for bad weather. 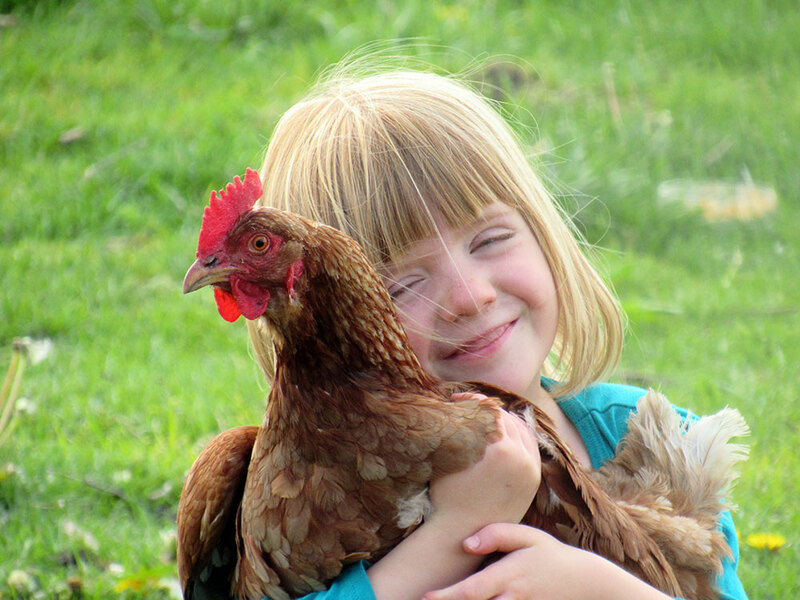 They can come and go as they please — they are NOT raised in a confinement building (CAFOs). No Antibiotics, N Hormones, No GMOs! But, Lots of Fresh Air and Sunshine! Our pigs have been enjoying their life in the pastured woods, eating acorns, hickory nuts, grasses, and our own non-gmo feed mixture. Just wait until you try our pork. You'll know this isn't supermarket meat. And, we have pastured chickens available for sale. If you have never had chickens raised out in grass and moved daily, then you're going to be in for a treat. It's a completely different product than what you find in the store or in restaurants. And we collect fresh EGGS daily from our Egg-mobile that roams the pasture from our Free-Range Laying Hens. 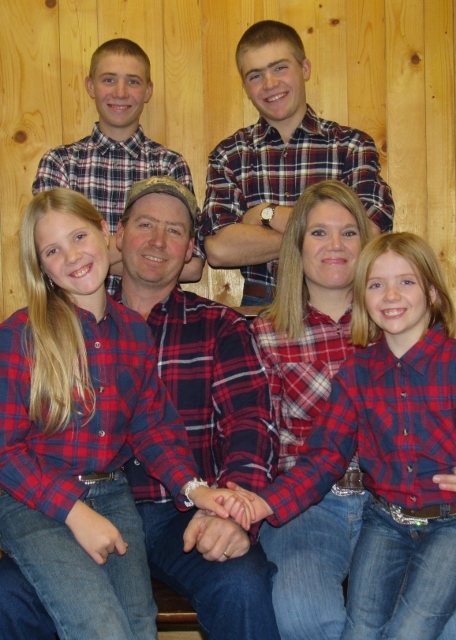 Paul and Joanne raise their 4 kids on the farm, where the whole family works together making it all happen through the thick and the thin, the good and the bad, the rain (and more rain) and the shine, the snow (and more snow) and the drought and now heavy rains, through the blessings of Jesus. Paul has been a farmer since 1994, when he bought his first farm land while still in high school. Paul heads up the farm, raising corn, beans, wheat, and hay, as well and tending to all the livestock, currently cattle, pigs, chickens, turkeys, and a horse, of course. Joanne earned a Masters in Agronomy from Purdue University, and is a Soil Scientist, in addition to being blessed as a farmer's wife and farmhand, as well as homeschool mom extraordinaire. The high school sweethearts married on July 4, 1998, and are carrying on the farming tradition from their grandfathers before them. Paul and Joanne are constantly planning up and researching new and old ideas to improve their farm and soil for the animals, their customers, and their children's future.